When you think of the term "medicine cabinet," you probably immediately think of several medications that are likely behind the cabinet's mirrored door. Medications like prescription drugs and headache tablets are among the most likely things that you find in any medicine cabinet, but not the only things. Medicine takes many forms and can be in tubes, packets and bottles. There are medications specifically for adults, children and babies. Not everything found in a medicine cabinet is even medicine, although they are usually health-related. When you want to stock up your medicine cabinet, we have what you need, all at Every Day Low Prices. Pain relievers come in three basic forms: aspirin, acetaminophen and Ibuprofen. A less common form is naproxen. For headaches and joint pain, acetaminophen, ibuprofen and naproxen are most effective. For muscle soreness use ibuprofen or naproxen. All four are effective on back, neck and shoulder pain and migraines. There are also specialty pain relievers that target joint and muscle pain, arthritis pain, menstrual cramps, urinary tract pain or migraine headaches. Some are designed specifically for children. Various pain relievers are designed for taking prior to going to bed since they cause drowsiness. These come in pill, caplet and capsule form and some children's mediation is available in flavored liquid form. There are also balms, creams and sprays that you can use for muscle and other topical pain. When you or someone you love gets sick or is getting sick, it helps to have some medicine on hand to help ease the symptoms and lessen the severity and length of the illness. Items to have in your medicine cabinet include decongestants for stuffy noses and congested coughs, cough syrup and cough drops to treat coughs and sore throats, nasal sprays to relieve hay fever and allergy symptoms, chest rubs to reduce congestion and fever reducers to keep fevers from elevating too high. For chest congestion, an expectorant can help loosen phlegm and help you breathe and sleep better. Another item that can help reduce the severity of a cold is medicated vaporizing liquid (you will need an electric or battery-powered vaporizer). For people who deal with upset stomachs, diarrhea, indigestion and other stomach maladies, there are many medications to alleviate these issues. Antacids and over-the-counter drugs like omeprazole held relieve heartburn, either in pill, chewable tablet, or effervescent tablet form. Laxatives and stool softeners help relieve consitpation and are available in pill, liquid and suppository form. Fiber supplements and anti-diarrheal medications, such as loperamide, are designed to relieve diarrhea. There are also medications that can relieve several of these symptoms if they occur simultaneously. It's helpful to have medications that help relieve nausea or motion sickness. 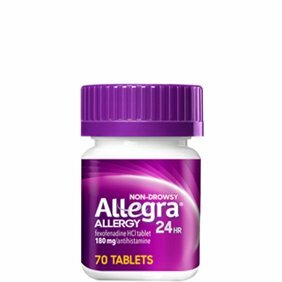 Antihistamines and medications, such as fexofenadine, cetirizine, diphenhydramine and loratadine, all available over the counter at Walmart, can relive the symptoms associated with allergies. Whether you are afflicted by grass or tree pollens, pet dander or other air-borne substances, these medications can offer you relief for a few hours or all day. There are nasal sprays that offer immediate allergy relief as well. Just like a fully stocked first aid kid, it always safe to be prepared and keep a good supply of first aid items handy in your medicine cabinet. There are numerous ointments and creams available that help heal cuts faster, relive the pain associated with burns and offer antibacterial and antibiotic properties. With many of these ointments, it is necessary to protect the affected area with bandages, and we have many different brands and styles. Rubbing alcohol and hydrogen peroxide are must-have items for keeping wounds clean and disinfected. For sprains, tape and flexible bandages can help add needed support. For sunburns, there are sprays and creams that lessen the pain and severity of the sunburn. Eye drops can help relieve eye pain, and eye wash can help clear the eyes of foreign objects. The list of other items that are useful in your home's medicine cabinet can run a wide gamut. Dental-related items like toothbrushes, toothpaste, dental floss and mouthwash are common items as are thermometers for checking temperatures. A well-stocked medicine cabinets helps you to be prepared for minor illnesses and first aid. Always talk with your doctor or pharmacist before taking any medications.